What's the solution to Apple's stinginess about Google getting an official Google Voice app on the iPhone App Store? A webapp that has about all the functionality, but usable on any HTML5-capable smartphone. The webapp mimics the functionality of hitting up Google Voice on your desktop. You can make calls, send texts, listen to voicemails, change your settings and access your contacts all from your phone's browser. It syncs up with your Google account's contact list—not your iPhone's contact list—so you'll have to make sure to sync your contacts to Google first. The Pre however, if you already have your GV account as one of your contacts, should have a more transparent process. Unlike the Google Voice app now, which calls your phone first and then connects the other party, you actually dial out directly into the Google Voice service, which then hooks you up with who you're trying to reach. It's going to be like the 406 numbers that Google Voice users are used to using for shortcuts to their contacts, but possibly not 406, since Google has a pool of numbers they are using. Google also tells us that you can add dialing credits directly from the phone if you want to make overseas calls, saving you the trouble of having to get on a computer. All in all, the experience is solid and fluid, mimicking an iPhone app as best as possible on a web interface. If we had any gripes, it would be that when you're texting someone from your contacts list, it only grabs the phone number and doesn't display the name after it. Also, that you can't text multiple recipients. 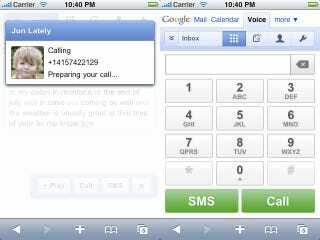 But calling from your contact list is fluid and takes only one more step than regular dialing from your iPhone.